At Mesquite Wash, Maricopa Co., Arizona, USA, at flowers of Buttonbush (Cephalanthus occidentalis). 27 Sept. 2015. Visiting the same flower head are a couple of bee flies in the genus Geron. 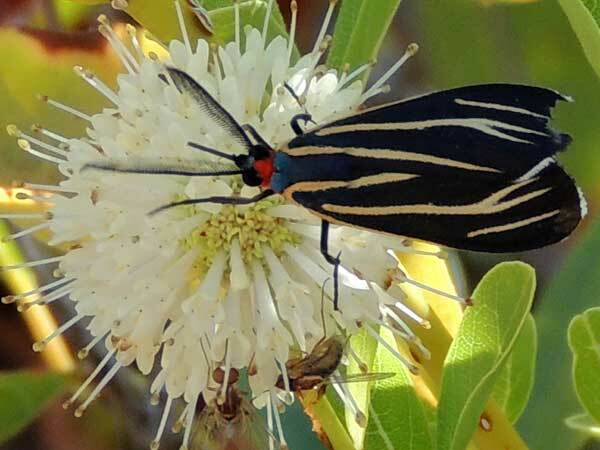 These colorful moths fly frequently during daylight when they will be found taking nectar at flowers. The bright colors are a warning to birds and others that might attempt to prey on them: their blood contains noxious compound that might even make the bird sick! The caterpillars are covered with long setae (hairs) and feed on various grasses.